Half-life: be able to draw a graph, find the half-life from a graph, be able to state what half-life is, be able to calculate the actvity of a source after 2 or 3 half-lifes (activity halves in one half-life, is one quarter after 2 half-lifes and is one eighth after 3 half-lifes). There are some good quizzes on yacapaca (ask your teacher about this). Click here to download the revision powerpoint. Practice Long Answer Questions eight questions with guidance notes and suggested points for some of the answers. It's Decay - includes alpha, beta and gamma decay, plus beta+ decay that we don't cover, but it's a good song. Types of radiation and penetrating power. Half-Life (based on Park Life) - Concentrates on GCSE, the singing is not brilliant and there is one error - background radiation is just radiation from materials that are around us all the time (e.g. from radon gas) and from cosmic rays (high energy particles from space). 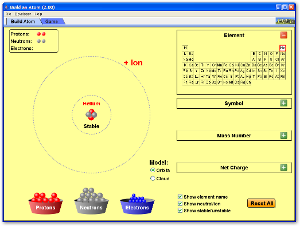 Try PhET's 'build an atom' activity and game to check your knowledge and understanding of atomic structure.